Casa San Sebastian is an unique design combining contemporary simplicity with natural organic elements making for the perfect architecture for this spectacular setting oceanfront overlooking the 3 majestic Los Arcos Islands. Award winning design with 4 bedrooms each with en-suite bathroom and a separate 5th full bathroom, a game room and over 8,000 sq. 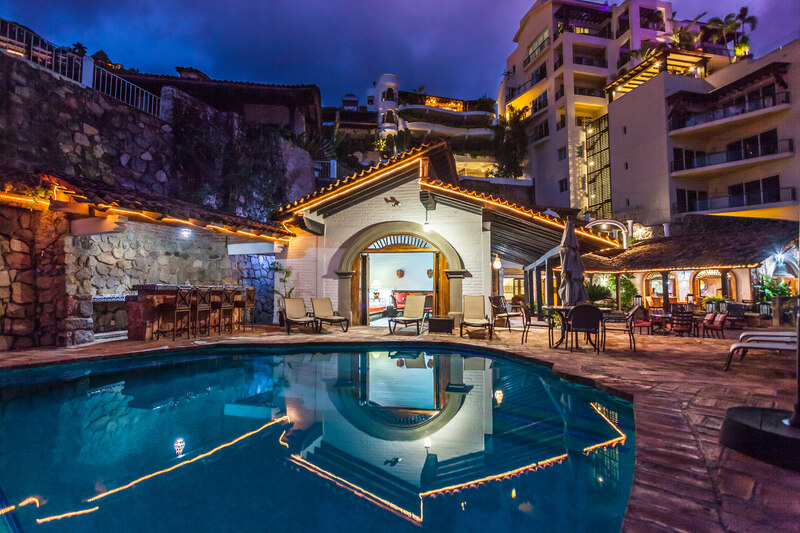 ft. emphasizing open living space and the breathtaking ocean views, with details like marble floors with inlaid mosaics of pebbles, sculptured over sized sofas, vivid Mexican textiles and artwork, carved wooden doors and high ceilings. The spacious glassed-in living and dinning area features a soaring thatched palm roof and flows out to the pool terrace and outdoor dining and living areas. Enter through a heavy iron door to a roof top terrace with giant pots of brilliant fuchsia pink buganvilia. Every 6th night free !! Game room with wide-screen TV, Bluray, movies, games and Foosball game. Satellite TV, stereo, garage, intercom, computer, fax and phone.